This section addresses the MAP-21 Section 1401(c)(1)(B) requirement to assess the volume of commercial motor vehicle traffic in the State. To meet this requirement, FHWA used data from a yearly survey or census of State data more commonly used in administering the Federal-aid highway program. The data provides an understanding of the level of the annual commercial truck activity as measured by combination truck vehicle miles of travel (VMT) on the National Highway System (NHS). Additionally, this section includes information derived from the State survey of adequate parking (described later in this report) to illustrate the supply of truck parking spaces in relation to the volume of trucks on the NHS in each State. Mapping parking supply and travel demand together creates the means to characterize the spatial distribution of parking patterns within a State and across the Nation to enhance the assessment of traffic volumes. Interstate: The Eisenhower Interstate System of highways retains its separate identity within the NHS. Other Principal Arterials: These are highways and roadways in rural and urban areas which provide access to a major port, airport, public transportation facility, or other intermodal transportation facility. 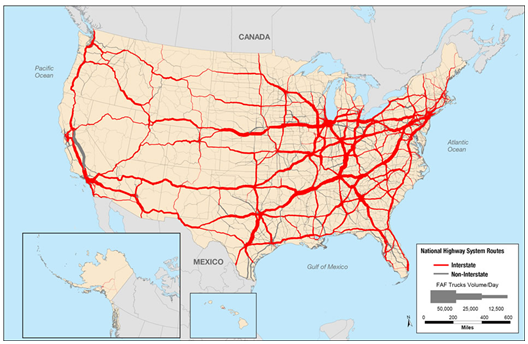 Strategic Highway Network (STRAHNET): This is a network of highways which are important to the United States' strategic defense policy and which provide defense access, continuity, and emergency capabilities for defense purposes. Major Strategic Highway Network Connectors: These are highways which provide access between major military installations and the highways which are part of the STRAHNET. Intermodal Connectors: These highways provide access between major intermodal facilities and the other four subsystems making up the NHS. The data to support the assessment of the volume of commercial motor vehicles engaged in interstate transportation is contained in the FHWA Highway Performance Monitoring System (HPMS), which houses data that is collected annually from State departments of transportation (DOT). The HPMS is a national-level highway information system that includes data on the extent, condition, performance, use, and operating characteristics of the Nation's highways. Truck volumes as collected and reported by States are the data that make up the traffic counts for the roads included in HPMS. In some cases, there may be missing traffic count information on segments of the NHS. The FHWA relies on States to provide information to accurately reflect traffic and road conditions in each State and works continuously with States to improve data reporting. This report uses the 2012 daily truck volumes collected by State DOT travel monitoring activities, which was the most recent data at the time of development. Both public transportation agencies and private truck stop operators supply parking spaces for truck drivers. Publicly provided spaces are typically at rest areas and welcome centers, and in some cases at weigh stations or truck inspection locations. Privately provided spaces are typically available at commercial truck stops for use by drivers accessing associated facilities for fuel, maintenance, food, bathing facilities, and other amenities. In nearly all cases, only limited services and amenities are available at public rest areas or welcome centers. Extensive services and amenities are mostly available to truck drivers at commercial truck stop locations. Throughout this report, the term “rest area” refers to publicly owned facilities, and the term “truck stop” refers to privately owned facilities. 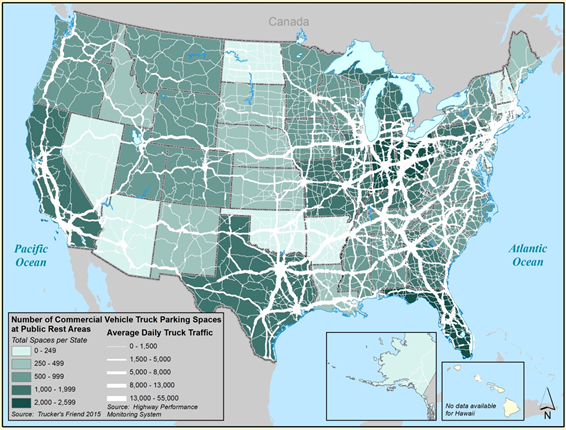 To collect data on spaces, the FHWA study team conducted an inventory of the number of truck parking spaces available to truck drivers as part of the surveys described later in this report. Each State DOT was contacted and asked to complete an inventory of the location and number of spaces currently maintained in the State on the NHS. In addition, in order to determine the number of private truck stop spaces, the study team procured and analyzed the 2015 Trucker’s Friend database. The 2015 Trucker’s Friend database is a commercial product marketed to the truck drivers that contains information regarding the location of truck stops as well as services provided at these stops, including the number of truck parking spaces. This database is updated annually. The distribution of the 308,920 total truck parking spaces at rest areas and private trucks stops includes 36,222 spaces (12 percent) at rest areas and 272,698 spaces (88 percent) at private truck stops. Appendix A contains maps for each State and reveals an assessment for each State shown with parking space information. Figure 1, below, provides a national view of truck volumes using the HPMS data. 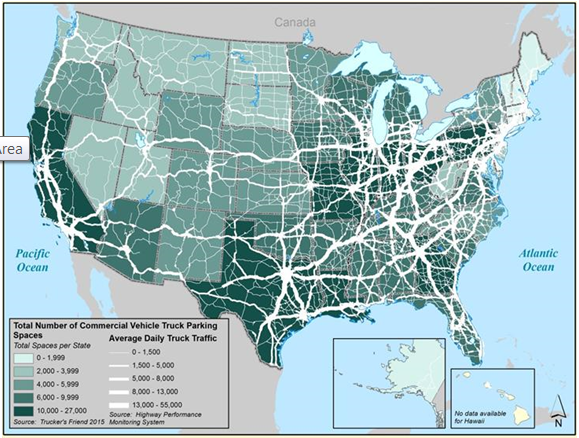 Truck volumes are naturally highest along major trade corridors connecting major metropolitan areas and freight-generating areas such as major ports or intermodal facilities. There are fewer spaces in major metro areas. It is not known if this is because there is parking at the destination or other areas, if drivers prefer to get out of metro areas for rest periods, or if this is a zoning and land availability issue. A significant share of the parking supply is provided by private truck stop operators. However, the size of these parking lots varies as do the available services. Many private facilities have less than 100 spaces. Figure 2 presents the parking lot size distribution of private truck stop facilities. Approximately 39 percent of facilities with parking provide between 1 to 24 spaces, and approximately 40 percent provide 25 to 99 spaces. The presence of shower facilities at a truck stop facility suggests that such a facility also includes other amenities (e.g., hot meals, entertainment, etc.) that would attract drivers seeking long term rest. 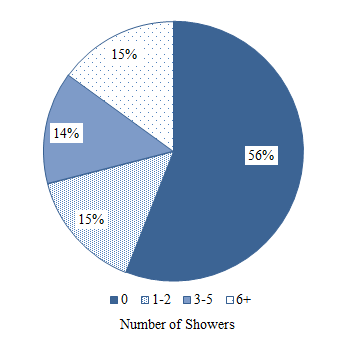 Figure 3 reveals that more than half of trucks parking facilities do not contain a shower. Figure 4 presents a summary of spaces at private truck stops on NHS roadways in each State. 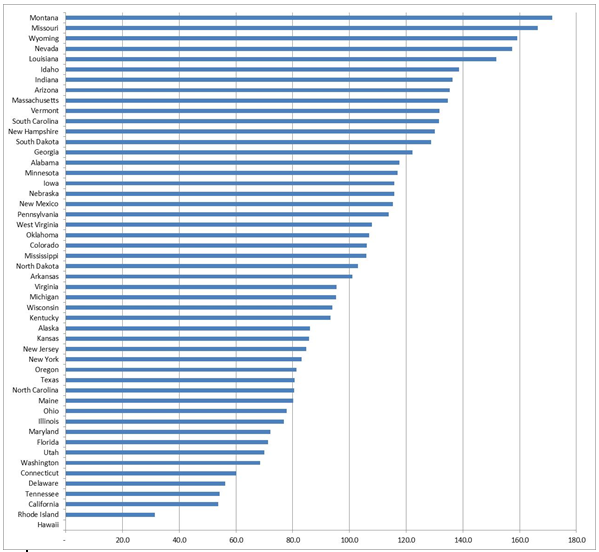 Louisiana, Indiana, South Carolina, and Ohio have the highest numbers of spaces while New Hampshire, Massachusetts, Vermont, and Rhode Island have the fewest spaces at private truck stops. 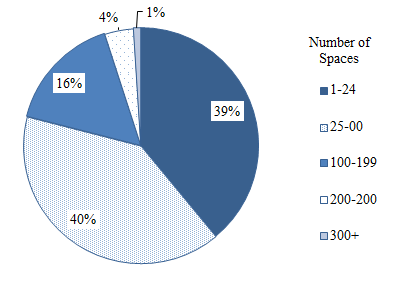 Figure 5 summarizes the number of public truck parking spaces by State. Survey results indicated that rest areas are typically open 24 hours per day, 7 days per week. Most States allow trucks to park for up to 24 hours. However, several limit the parking duration to between 2 and 10 hours. The number of truck parking spaces available in public rest areas is generally much less than the spaces available at private truck stops. On average, there are 7.63 private truck stop spaces for each public rest area space in the Nation. Figure 6 summarizes the number of total commercial vehicle parking spaces on NHS roadways in each State. As summarized in this figure, Indiana, Ohio, Connecticut and West Virginia as among the States with the highest numbers of spaces while Arkansas, Oklahoma, and Rhode Island have the lowest numbers of spaces. 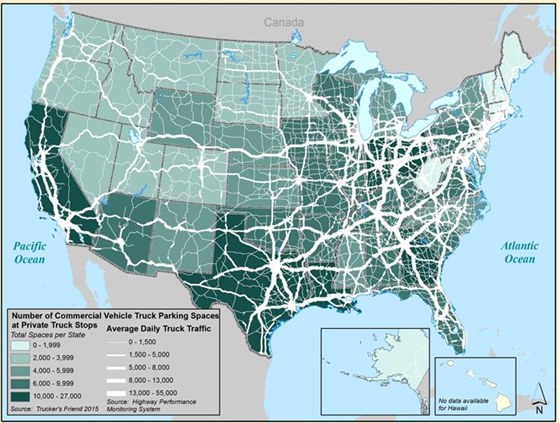 Figure 7 summarizes the commercial vehicle truck parking spaces per 100,000 miles of daily combination VMT for each State. The highest rates occur in Montana, Missouri, and Wyoming. The lowest rates occur in Tennessee, California, and Rhode Island.